Dead stuff is rarely much to look at, like roadkill or wilting plants or Bill Cosby... wait, he's not? They did it again? Damn you Twitter! Turning reclaimed gone-to-the-grave wood into living-room-wall-worthy hangings, Dave Marcoullier Designs. From a full-time landscape architect and arborist (or less formally: tree doc) who's obviously got a thing for lumber, DMD preps/cuts/sands/stains ready-to-hang home art from a rented shipping crate in Potrero Hill, all outta 1-inch-thick Walnut, Mahogany, Birch, or Brazilian Jarrah, but not Sayid Jarrah 'cause working with that stuff is torture. 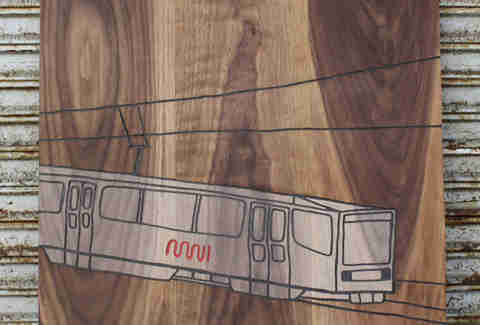 Using a triple-axis laser cutter and hand router to work pieces as small as 8" x 8" and large as 2' x 3', Dave's artwork's all about "design", with textbook-worthy etchings of artsy-looking human body parts (heart, lung, brain, pelvis), and wood cut-ups of Bay Area touchstones like MUNI, Sutro Tower, the San Francisco skyline, and the Oakland docks... ok, so three Bay Area touchstones. 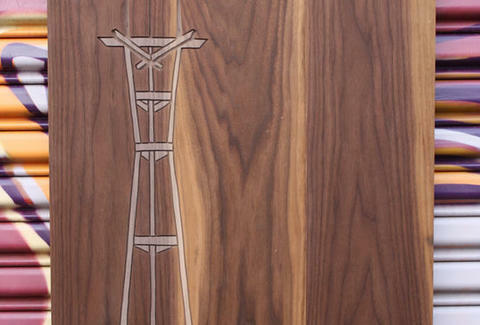 He's also got a why-didn't-I-think-of-that series of six where he simply traces over the wood's natural grain lines with his mini-saw to create an exaggerated, cool-looking cross-section of timber, as a cross-section of timberwolves would not be cool looking, thanks to Kevin Love's chinstrap. According to the man himself, he's about to do several new large scale wall panels that'll be mosaic-esque (with wood instead of tiles), and there's a ton of fresh routings about to drop, which if you believe the rumors, ain't too different from the Cos'.